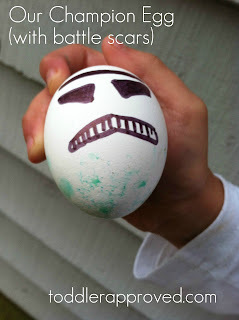 Today I'm sharing what my family does with our decorated hard boiled eggs before we eat them. I'm unsure of the origins of this tradition, but know that it's something that has been done in my family since my grandma was a little girl. 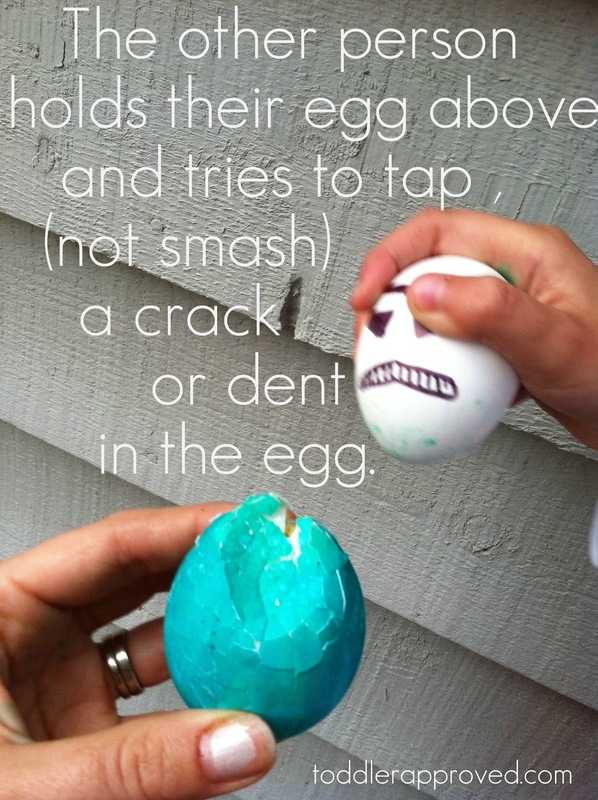 The basic gist of an egg war is to try and crack each of your competitor's eggs without yours breaking. You face off two at a time . 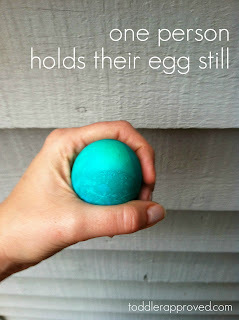 . .
Whoever ends up with a non cracked egg faces off with the winner of another division. You continue until there is only one person with a perfect egg - that individual is named "the egg champion" and the losers "eat their eggs". To this day, no one can beat my grandma - she has a secret technique (whether she's the holder or the hitter). When she was younger, the champion in their household would take their winning egg and compete with other egg champions in the neighborhood. Have you ever heard of this tradition or participated in an egg war? 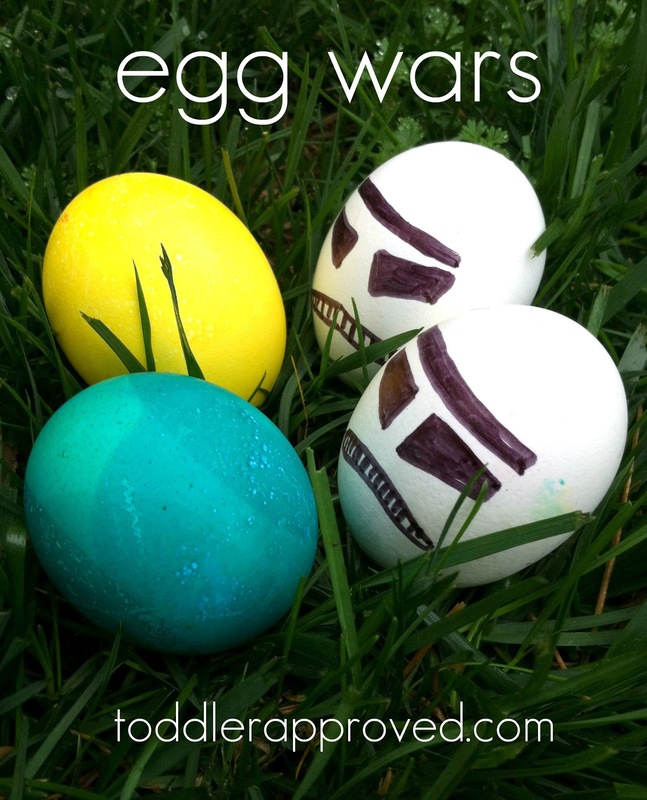 I've never heard of egg wars! What an interesting tradition. The tradition comes from Ukraine, and probably other countries in the area. We call the edible, painted 'challenge' eggs krashanky (not to be confused with pysanky, which are batik-painted as symbolic artwork with non-edible dyes). It looks like the empire struck back! Hahaha the way all good games end! The egg wars have always been known as "stootzing" in our house, my Dad did it as a child, we did it and now my children do it. My DD did a project on this several years ago in school and found it to be called Eier pecken. We thought it originated in Germany as we are of German descent but no other Germans we know have heard of it. She discovered that it is common in the Rhineland or among Germans in Swizterland. 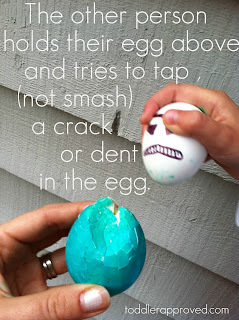 My mother's family were Dutch and English primarily and were doing 'egg cracking' on Easter in the 19th century, (Mom's 91 now). None of the large family had any idea where the custom came from. 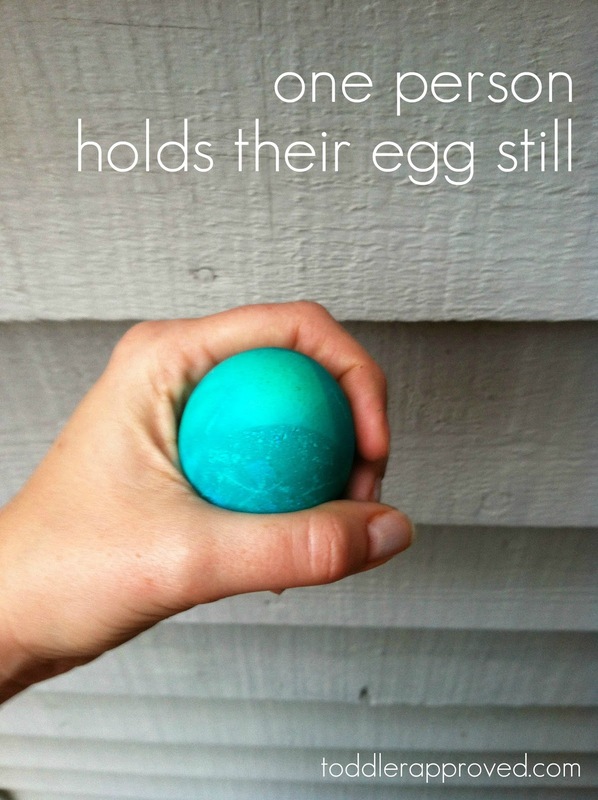 We just try to hold the egg in the way that protects its sides most and peck away at the opponent. The winner gets a prize, sometimes a coffee mug or even car wash tickets, often very necessary that time of the year. My limited research indicates that the custom is common in the Balkans. This is the tradition in Latvia and Lithuania (and probably throughout the region, as an above commenter said). People there keep their onion skins throughout the winter, then dye eggs in boiling water with the onion skins. To get fancy, they'll lay leaves or flowers against the eggs and hold them in place with bits of old nylon twisted and tied. It works like batik; the area under the leaf remains white while the rest turns a lovely golden brown. Our family has this tradition. Everyone looks at me like I am crazy when I describe it to them. Our family has this tradition. Have been doing it for years. Everyone looks at me like I am crazy when I describe it to them. I've been living in Greece for the past few years and at Easter they collect up all their eggs, boil them and then dye them using a red dye that's specially sold for that purpose. At the traditional Easter Sunday barbecue, huge baskets of red eggs are brought out and the egg wars begin. There are smashed eggs all over the place and most people eat far too many eggs in one go, but it's great fun. My family has been doing this for generations but we don't call it Egg Wars its an old Cajun tradition here in Southern Louisiana , we call Paque or pocking Eggs http://1079ishot.com/the-art-of-pocking-easter-eggs-in-south-louisiana-video/?trackback=fbshare_top . It's neat to see what others call it ! Yes, I am from Bulgaria and we do this every Easter when we color our eggs !! !